Just an idea I wanted to commit to pixels, basically the projectile blocks the chamber, retained by an o-ring that simultaneously prevents it from moving while sealing it. The o-ring is deformed by the force from an unbalanced piston. 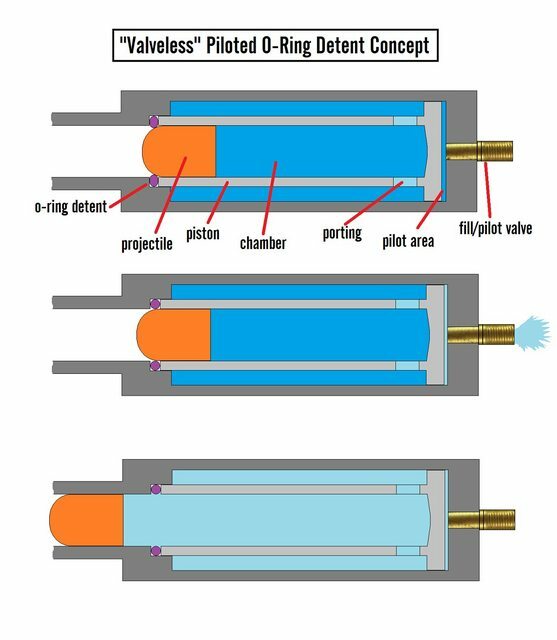 When the pilot area is emptied through the pilot valve, the piston is forced back, removing the pressure on the o-ring and allowing the projectile to slip free. This looks like it would be great for a cartridge ejecting airsoft gun, but I don't fully understand how it works. Is it like a coaxial piston where the vented air from the fill valve moves the entire chamber back? The air is already pushing on the base of the projectile but it is prevented from moving. Exhausting the pilot moves the piston back which then unlocks the projectile, allowing the pressure to force it out. This good idea, you just have to build a prototype and try to see the small adjustment problems that are never missing, and should work perfectly. In the diagram first, you should make sure that the force of the piston that deforms the o'ring is always greater than the force that the air gathers against the ammunition, especially during the loading of the cartridge. While potentially viable in theory, I suspect that in practice, this would be leak-prone (sealing that will be a bugger), likely to eat through o-rings (the wear as the projectile pushes through), difficult to load (unless the projectile is going to be held in exactly the right place as the pressure is brought up, I suspect that the O-ring won't deform and seal enough at low pressures), pressure limited (at a certain point, the projectile will just push through the o-ring), picky about ammo (it has to have a perfect seal), I'm not sure the flow through the porting is going to be great, and I wouldn't be surprised if it was prone to accidental discharge. I'm not sure I see any advantage to this valveless concept over a miniature co-axial piston valve, which is going to be a lot less temperamental, as well as less demanding about what it's loaded with. It would be limited to projectiles with a polished nose, yes. The idea is that once the o-ring is uncompressed, the projectiles needs no effort to go through - though of course the compression itself will take its toll on the component. Follow the pressure path if you fill through the pilot - compression of the o-ring is instant and a tight fitting projectile would be forced into the right place. The compression of the o-ring is proportional to the pressure, and my experience with hybrids indicates that an o-ring in compression is capable of retaining a projectile even with many hundreds of psi behind it. This is true of any valveless design. With big enough porting it should be OK.
and I wouldn't be surprised if it was prone to accidental discharge. Not sure I'll build it, but for a pneumatic cartridge type device it would maximize the internal volume while as well as offering burst disk levels of performance while being re-settable. With the necessary material you can retain the ammunition. The air line that you see is the one that you have to decompress to shoot. A thick silicone tube could be used. hectmarr wrote: With the necessary material you can retain the ammunition. The air line that you see is the one that you have to decompress to shoot. A thick silicone tube could be used. jackssmirkingrevenge wrote: The idea is that once the o-ring is uncompressed, the projectiles needs no effort to go through - though of course the compression itself will take its toll on the component. More than that - it's not a binary thing, so at some point there's going to be a partially compressed O-ring that the projectile will have enough force to push through. True, but that doesn't mean it's not an argument to be taken into account. I suppose as a technical "can we do this" experiment, valveless is one thing, but in practical terms the question is if any performance benefit is worth the drawbacks of the design. If every projectile needs to be precision engineered, it does need to have a tangible pay-off. It's more than just raw area. It's about the smoothness of the flow (ultimately your flow area is limited to that of the barrel) and flow through several small ports is inevitably going to be more turbulent than through one large one. "Burst disk levels of performance" is a fairly hypothetical bar though. To many people that means "instant", but valve opening time is something of a red herring when it comes to performance, because the fixed variable in the projectile's acceleration is distance, not time. A one millisecond valve opening might seem slow when you consider a projectile being in the barrel for 10 ms, but when you consider that (treating it as constant acceleration for the case of simplifying the maths) means the projectile has only swept the first 1% of the barrel (as per s = ut + 1/2*at^2) by the time the valve is open, valve speed is clearly a case of diminishing returns as far as muzzle energy (being the integral of net force against distance). It doesn't matter if the valve is infinitely fast, that only means an additional 1% performance (so small it'd be lost in shot-to-shot variance). Flow becomes more important here - and like I mused, I'm not convinced you're going to get clean flow through those ports. That being said there are however other benefits to consider, for example you do not need a lot of piston movement, and assuming your piston has an o-ring seal, the pilot valve opening speed and flow is irrelevant to the performance. That first design schematic looks like it might be super touchy to tune. But this last one looks perfect for my next build; bolt action precharged cartridge airsoft sniper... With standard shop tools, it might be a pain to build, but with a lathe in the equation, it might actually be the simplest method. Last edited by mako on Wed Apr 11, 2018 8:41 am, edited 1 time in total.